Do you ever dread cleaning just because of the sheer amount of time it takes? As a company who has been offering local cleaning services to the people of Gloucester for years, we’ve seen more than enough instances where people call on us just because they don’t want to burn away their day while cleaning. This is understandable. Cleaning can take a long time, and you probably have better things to do. Unfortunately, it’s not always practical to call a local cleaning company, and in those times, you’ll want to clean as quickly and efficiently as possible. Ever wonder how the experts can do things so quickly? Here are some tricks we use as professional cleaners that help to expedite the process — try putting them to use next time you have to do some cleaning of your own! This is one of our go-to tricks as professional cleaners. Some rooms are easier to clean than others, and it’s best to just knock those out of the way before you get onto the hard stuff. Kitchens, bathrooms, or any other room that will require a lot of scrubbing or mopping should be saved for later. It’s easy to get hung up on the details and spend way too much time on these rooms, and then you’ll feel deflated once you’re finally ready to move on to the easy stuff. When you order local cleaning services, there’s a reason you don’t see them browsing their phones all the time. Aside from looking unprofessional — distractions are the bane of quick cleaning jobs. When it’s time to clean, put away your phone (no, not in your pocket) and turn off that TV. If you want some background noise, music is a good alternative to screens, so long as it’s not too distracting. A professional is nothing without their tools. As it turns out, professional cleaners weren’t born with cleaning superpowers. Most of the time, they’re just better equipped for the job, allowing them to work faster and more efficiently. It’s good to invest in high-quality tools that come recommended by professionals. These will break less often, do the job better, and call for fewer trips to the store, which is often one of the biggest timesinks in a cleaning job. Speaking of supplies, one of the tricks of the trade is keeping them all together, and having them with you at all times. When you see commercial cleaning services, they don’t pull those cleaning supply carts around as a hobby; they’re fundamental to their job and allow for a much cleaner job because they have all the supplies they need on hand. You may not need a massive cart at home, but keeping your supplies in a tote or something similar is a good way to speed up the job. Of course, if you really want to save the most time, the best option is simply to call a team of professionals. 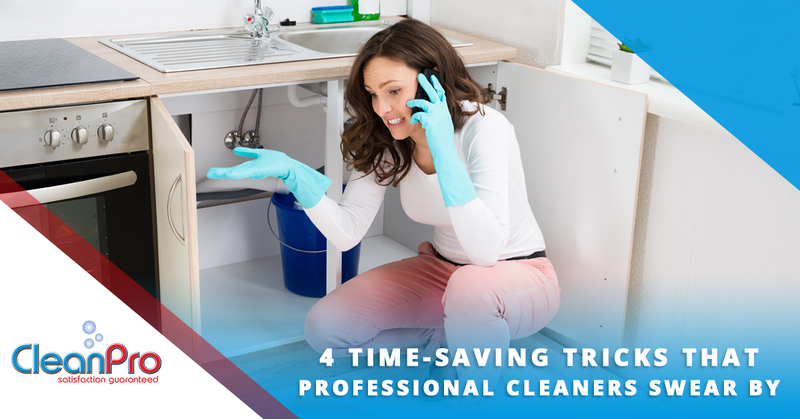 CleanPro has served countless residences and businesses with high-quality cleaning services. If you’d rather not go through the time and effort yourself, contact us today!